As you may know, I’ve spent much of the last three months working to help contain the BP oil spill. I recently returned from my seventh trip to Houston, and I thought this would be a good opportunity to update you on our work to seal the damaged well in the Gulf. My job has been to oversee the federal science team – a group of top scientists from the Department of Energy’s national labs, the federal government, and academia, along with outside industry experts. We have been working seven days a week to tackle this very challenging problem. Our focus has been on collecting as much data as possible and making sure we plot the best path forward based on the facts. Because of the gravity of the situation, the Administration asserted its authority over BP’s actions. As we evaluated the scenarios for stopping the leak, BP was not allowed to move forward on a course of action without the government’s approval. The results of the well integrity tests (including additional monitoring of the wellhead and the surrounding area, which we had insisted upon) indicated that the well was likely intact, and we saw no evidence that oil was leaking from the wellbore into the rock formation. This meant we would be able to safely pump fluid into the well to attempt to kill it. After the science team reached a consensus that the static kill attempt could work with minimal risk, we gave BP the go-ahead to proceed. During the static kill, the damaged well was filled with mud, stabilizing the pressure within the well and relieving a lot of the excess pressure on the damaged blowout preventer and ceiling cap. I am pleased to tell you that it was completed successfully. This success led to a much more difficult decision: should we follow the mud with cement to further ensure that the well stays killed? This procedure had a higher risk of something going wrong. With cement, a mistake in execution could be permanent. We also had to weigh the dangers of having so many ships conducting operations within 1,500 meters of the wellbore and of the strain already being placed on the blowout preventer. Continued operations were also taking a toll on the ships’ crews; the longer they worked, the greater the danger. Still, the risk of something going wrong was very small, and the potential for dramatic progress was very high. Successfully cementing the well would be a major step toward completely killing the well. We decided to proceed with the cement. All signs indicate that the cement is holding. This is a significant step forward for the people of the Gulf, but our work is not done. The relief well is the permanent solution, and we hope to be able to intersect the Macondo well with the relief well soon. We also must remain focused on helping the people, businesses and communities in the Gulf Coast region who have been affected by this spill. Restoring livelihoods and the environment in the region will take much more time than plugging the well. We don’t want any chance that oil will flow from the well again. I will continue to work closely with the science team and the BP technical engineers in the coming days to make sure that the well is completely killed. 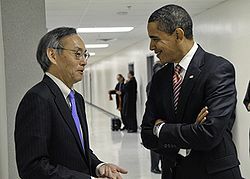 Nobel Laureate Dr. Steven Chu is the U.S. Secretary of Energy. Reposted from The Energy Blog.